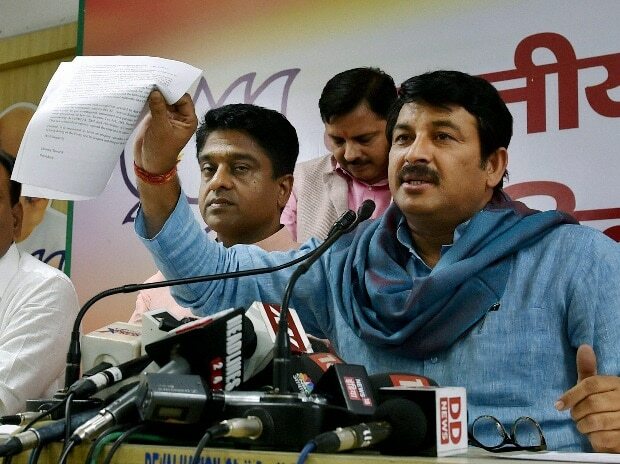 Leaders and workers of the BJP's Delhi unit, along with its president Manoj Tiwari, were detained near the Congress headquarters Wednesday for protesting against Rahul Gandhi, who they said was spreading "lies" on the Rafale deal. The protesters had assembled at the Vigyan Bhawan and raised slogans against the Congress and its president, who has been instrumental in mounting a scathing attack on the Modi government over an alleged "scam" in the deal for the French fighter jets. "We are here to expose the lies of Congress and its president Rahul Gandhi who is spreading lies on the Rafale deal on a regular basis," Tiwari said at the protest. The protesters then tried to move closer to the Congress headquarters at Akbar Road but were stopped at a police barricade. They were later detained and taken to the Parliament Street police station. The district presidents of the Delhi BJP had on Tuesday submitted a memorandum, addressed to the President of India, to respective district magistrates in the city. "Even after the dismissal of petitions challenging the Rafale deal by the Supreme Court, Congress president Rahul Gandhi continues his propaganda, not only insulting the prime minister but also demoralising the defence forces of the country," the Delhi BJP chief said. Notwithstanding the Supreme Court's verdict on the deal, Congress president Rahul Gandhi had on Friday maintained that there was massive corruption in the contract.